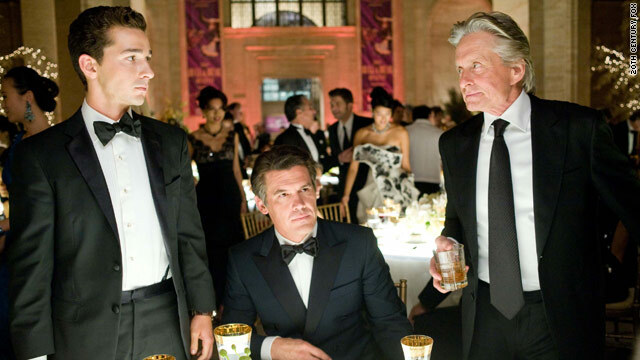 Gekko's back: Shia LaBeouf, Josh Brolin and Michael Douglas in Oliver Stone's "Wall Street: Money Never Sleeps." "Wall Street: Money Never Sleeps" is the follow up Oliver Stone's 1987 hit film "Wall Street"
(CNN) -- Gordon Gekko-inspired suspenders may have faded from Wall Street and lunch isn't for wimps anymore, but if there's one thing that hasn't changed in the last two decades it's this: greed is good. With his new film director Oliver Stone is back to exposing financial chicanery, this time showcasing how complex and unfettered the system has become since his 1987 hit film "Wall Street." What did he find when he returned to the scene after more than two decades? After years of bank deregulation, Wall Street "got ridiculous, and I mean it's insane. It became a financial casino," he told CNN. That outrageous environment serves as the backdrop for "Wall Street 2: Money Never Sleeps," a follow-up film which, amid massive bank bailouts, sweeping financial reform in Washington and investigations into the practices of Wall Street's leading firms, couldn't be more timely. In the movie, Michael Douglas reprises the role of corporate shark Gordon Gekko. Fresh out of prison, he finds himself in a new financial era dominated by complex products and securities. "Money Never Sleeps," which is slated for release in September, is a "bookend" rather than a sequel, to the 1987 film, Stone says. Stone, whose father worked on Wall Street as a broker, set out to tell a morality tale about excess in the original film, with Gekko positioned as the bad guy. But judging by the recent financial crisis, not many Wall Streeters took Stone's message to heart. Instead of being seen as a villain in the 1980s, Gekko became a paragon of success for a generation of traders and business school graduates. Douglas, who won a Best Actor Oscar for the first "Wall Street," said he's always surprised at the reaction MBA students have to Gekko, the suspender-sporting character out to win at all costs. "They would come up to me and say, 'Hey Gordon, he's the man,'" he told CNN at Cannes, where the film premiered earlier this month. "And probably a lot of those guys...are heading up investing banking companies now," he said. [The financial crisis]was an event of monumental importance socially, economically, for the United States. In the follow up film, Gekko is looking to get back into the Wall Street game and finds a way through his estranged daughter's boyfriend, a young investment banker played by Shia LaBeouf. Joining the cast, which includes Susan Sarandon and Josh Brolin, was like "stepping into a cage of lions," LaBeouf said. "I felt like an underdog coming onto this set. I'm the 'Transformers,' kid. It's just like, it's daunting." LaBeouf and Carey Mulligan, who plays Gekko's daughter, play a young couple with ideals. (The couple has also been linked together offscreen.) But their integrity is tested and "everybody has double motives," Stone said. A director known for offering provocative viewpoints, particularly in political films like "W," "JFK" and "Nixon" -- his next film, "South of the Border," is about Venezuelan leader Hugo Chavez -- Stone initially wasn't interested in telling another story about Wall Street. When the producer of the original film and 20th Century Fox made a deal for a follow up film, Stone wasn't on board. "I didn't event want to do a sequel and I turned them down," he said. What changed? The financial meltdown of 2008, which unleashed the worst crisis since the Great Depression and caused the economy to suffer in Stone's words, a "triple bypass heart attack." The financial crisis "was an event of monumental importance socially, economically, for the United States," he said. "It wasn't a perfect storm, it was a systematic breakdown that was due because it's the way the system is run." While the director certainly harbors strong feelings about the financial system, he also had his fun with the film. He appears briefly, as does Charlie Sheen, who played Gekko's protégé Bud Fox in the first film. "I was having fun, you have to have fun," Stone said. Just like the original "Wall Street," "you have to take this with a grain of salt because it's so depressing otherwise." Mulligan says the film is first and foremost an entertaining story. "It's really about people enjoying it as a movie," she told CNN. "Because it's not just a lesson in finance, it's love stories and rivalries and a brilliant villain in the middle of it."